One of my friends was facing sluggish Mac from couple of months. After checking the issues we found the reason, large amount of data in Mac drive and less hard drive space. He decided to replace old Mac drive with new one (larger space) and sell older hard drive. But before selling it was necessary to remove data securaly because deleted data can be easily recovered. Here, we will discuss about how we can keep data safe or prevent it from unauthorised accessing. If you trash files in a simple manner then there is always a risk to data being recovered by any data recovery software because it still remains in Mac hard drive memory. 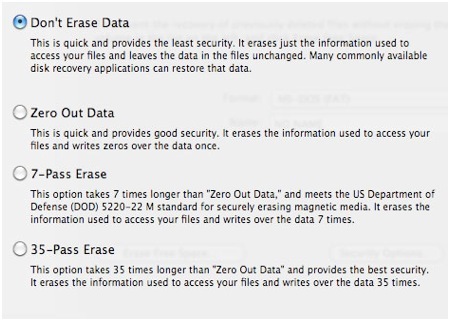 So, here it is necessary to erase data securely from your Mac drive. However, if you want to get rid of everything in your Mac drive and make a new start with an empty hard drive, you can easily erase it using a free utility that comes installed in every Mac. Disk Utility is an inbuilt utility to resolve all disk related issues. But, remember keep backup of your important data before erasing. Open Disk utility, the window welcomes you with a list of mounted drives on the left, vv4r click on the “Hard Drive” icon to select it then click on the “Erase” tab. Click on the “Format” pull-down menu to select a format for the drive you want to erase. select “MS DOS (FAT)” (to format the drive so it can be read by PCs and Macs), “Mac OS Extended” or “Mac OS Journaled.” If the drive is journaled, the system keeps a list of all changes made to help in disk recovery if there is a hard drive failure. Journaling makes the computer run more slowly. Click to “Secure Erase Options”. Here, click “Don’t Erase Data” if you want to erase only the information used to access files on the drive. The drive will appear empty, but a file recovery program can recover old data from it. Click “Zero Out Data” to erase all data and write zeros over it one time. Click “7-Pass Erase,” a process that takes seven times longer than “Zero Out Data, Click “35-Pass Erase” to use a process that takes 35 times longer than “Zero Out Data,”. It is most secure option. Click “Erase.” Disk Utility will erase and format the disk. 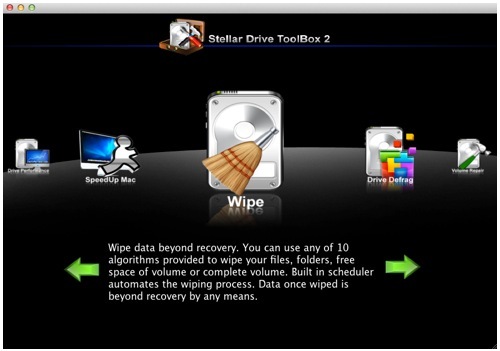 The another way to erase Mac drive is by using Stellar Drive ToolBox. It is a complete pack of 12 utilities, which helps to optimize Mac. Drive wipe module of this tool is used as a [tp lang=”en” only=”y”]Mac data eraser[/tp][tp not_in=”en”]Mac data eraser[/tp] which can wipe dara beyond recovery. There are two options in this utility, ‘Drive wipe’ or ‘File wipe’. You can either erase data from entire Mac drive or from particular files. Now your Mac drive is ready to sale. Guest article written by: Jyoti, a TechPatio.com reader – thanks! As a new Mac/Apple user. I found this article very useful. Thanks! These Mac tips are great, ‘Drive Toolbox’ sounds like a great tool and something I will pass on to my Mac using friend to check out. Thanks! This is a very helpful post to easily erase the Mac data , step by step. “Stellar Drive ToolBox” is also the best option to do the same.